The Red Master Travel Right harrow is designed for synthetic footings. The gauge wheels and tires control consistency and depth. It has three tire height adjustments. 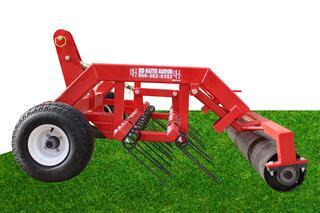 Both rows of coil tines adjust the depth with one turnbuckle, while the 3-point supplies additional depth control. The Paddle Wheel Roller is an eight inch diameter pipe used to tighten up the surface. A tow hitch at the rear of the harrow provides towing capability for the Red Master Roller (a 20" diameter pipe that can be filled with water to achieve proper weight). Coil tines act as a rake to work up the footing surface and will not cut into your base. If footing gets hard packed the ripper option can be added to this harrow to break up even the hardest footings.